Inspired by Ellen's love of artisanal, yet simple designs, ED crafted by Royal Doulton encourages everyone to embrace their own style and express their individuality throughout all parts of life. Bringing Ellen's personality to life, the Cave Animal Mixed Set embodies Ellen's love for animals. 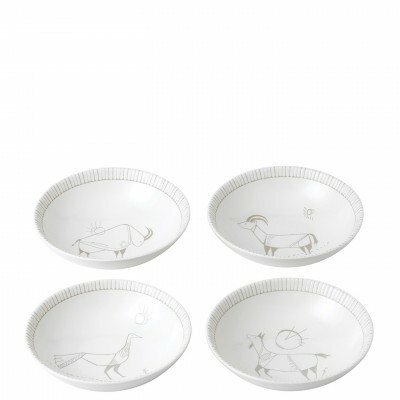 Featuring a natural taupe palette, unique hand drawn animal characters stand the test of time on this set of four 5.5" Bowls. Perfect for anything from snacks and desserts to storing jewelry or keys, these bowls are a must-have. If you have any questions about this product by Ellen Degeneres, contact us by completing and submitting the form below. If you are looking for a specif part number, please include it with your message.